In fall 2014, I lived for two-and-a-half months with a small, Evangelical Christian community in Greatham, England, called L’Abri (French for “the shelter”). The L’Abri Fellowship in Greatham is one of eight such communities which have been established around the world and grew, like the rest, out of the pioneering ministerial efforts of Francis and Edith Schaeffer. Although I was at L’Abri for only ten weeks in my senior year of college, I was transformed by my experiences there. Deep wounds began to be healed and confusions clarified; the spiritual life as fundamentally a relational life with God, others, and even myself began to open like never before, as concepts of faith became lived realities. I experienced challenges, of course, understanding for the first time key differences in belief, from a Christian perspective, between the Christian and Unificationist worldviews, and carry fundamental questions of faith that arose from my time there even now, almost four years later. Principal among these is the question of the replicability of L’Abri as a model of spiritual community. Were there spiritual principles at work in the structure, practices, and functions of L’Abri that allowed it to so deeply touch not only my heart and life but the hearts and lives of many others? Could these principles be applied in another context, for instance, either an extant or a potential Unification faith community? My time at L’Abri and other experiences in the last few years have convinced me of the value of having the home serve as the hub or basis of ministry, as well as True Father’s prescience when he attempted to initiate the home church providence in the Unification Movement over 40 years ago. When I first left for L’Abri, I had little sense of what the experience would entail. I had heard about L’Abri like most others who have walked through the doors of its various branches around the world, by word of mouth, since L’Abri has eschewed any formal advertising about their work. I would learn soon after arriving that life at L’Abri was disarmingly practical and logistically predictable. Half of each day was spent in personal study. “Students,” as we visitors were called, were each assigned a tutor from among the workers shortly after our arrival. We would meet once a week to discuss life and any pressing questions we might have; and on the basis of our conversations, our tutors would recommend different avenues of study for us to consider, ranging from readings among the Christian classics to audio recordings of lectures given at L’Abri over the years, stored in a digital archive. Whether or not these avenues were pursued was totally up to us, so our studies unfolded week by week according to personal inclination, community wisdom, conversation, and prayer. The other half of each day was spent doing any number of chores needed around the Manor House, in which most of the students and workers lived, or the adjoining domiciles on the property. The evening schedule varied day to day but was consistent week to week. On Tuesdays and Fridays, we all gathered together in the slightly makeshift communal study area for formal lectures. The Tuesday lectures were private. Friday lectures were open to the public. Mondays and Saturdays were free evenings. On Wednesday evenings, we would watch and then discuss a film together. Our Thursdays were free, allowing us to travel around and tour England. And Sundays were sabbath days in the traditional sense, with services in the morning at any of a number of local churches. Eating meals together was a key element of community life. For most dinners and all lunches, the students were divided into smaller groups of about 10-12 people. We had “formal lunches” every day of the week but Thursday: a time to discuss a single question, usually of faith, though any question was a feasible basis for discussion. Dinner conversations were usually more open-ended and informal. 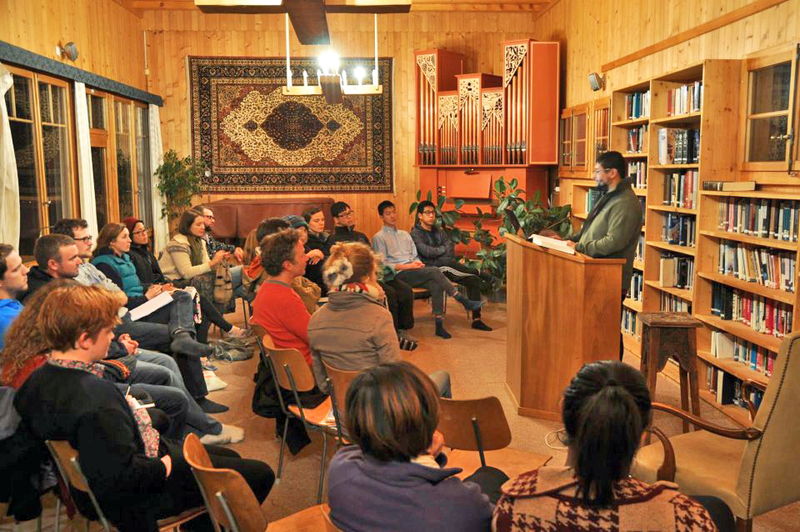 A lecture at the L’Abri branch in Switzerland. Students could stay for as little as an afternoon to as long as three months in this manner, adding a layer of transience to this otherwise constant—though never static—community dynamic. Slowly and subtly, in this ordinary, though perhaps unusually intentional, daily life, I noticed a change in my mood and spirit. It was more than just getting used to the lifestyle and people there: I felt I was being revived from a kind of spiritual death or sleep that for many years I had been oblivious to. It was like undergoing an inner reconciliation of self. The ideas we discussed were restoring clarity to my mind and renewing a confidence that something real exists beyond myself—a confidence that had begun to erode amid the relativistic tropes of contemporary culture. I was experiencing, in L’Abri terms, “substantial healing,” which was so surprising to me because that had not been my intention in going to L’Abri, and because I had never anticipated the possibility of genuine healing in the context of any faith community but my own. This genuine surprise and experience of substantial healing was in many ways the source of my curiosity about vital community and its significance as a context for the cultivation of authentic faith. It was hard to comprehend what I was experiencing at L’Abri because I was so wholly unprepared for it at the time, but the experience was undeniable and its positive effects lasted in my life longer than any comparable experiences I had had in Unification faith settings. And because I did not become a Christian at L’Abri, by L’Abri’s definition of the term, I began to wonder to what extent my experience of healing was intrinsically tied to the Christian faith and to what extent it pointed to extrinsic principles by which vital community could be built in another religious context. Of course, L’Abri considers its work innately Christian. 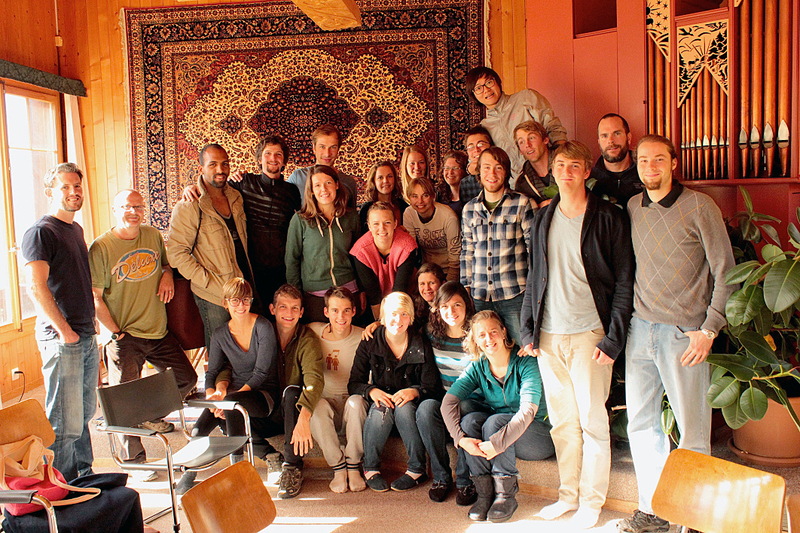 It’s important to acknowledge the centrality of theology to the L’Abri Fellowship. But L’Abri is not preoccupied merely with the assertion or proclamation of correct doctrine. The fellowship is also committed to a practical expression of the Christian faith, to sanctification and a flourishing Christian life: a growth in spiritual maturity that finds greater outward expression in one’s actions and choices over time. There are many ways in which this practical aspect of the fellowship’s work could be described, but I believe the theme which encompasses most of these is L’Abri’s commitment to hospitality. The key idea is that of “welcoming the stranger,” the stranger being those who are somehow displaced or alienated as well as those whom we do not know. When we invite the stranger to join us in our daily life and at our table we are “dramatizing the Gospel in a very concrete way” because in welcoming the weary stranger, we are also welcoming Christ. L’Abri’s commitment to hospitality shone through in their endeavors simply to create beauty and offer warmth in their homes, to whatever extent they could. The creative life, expressed in the care we take in preparing meals, in candles lit on the dinner table, tasteful table linens, furniture chosen and placed for connection and conversation, geraniums on the window sills and roses growing over the walls—all these simple things represented a significant part of the restorative quality of life at L’Abri; the care of the environment in which we lived translating into a sense of care for the soul. As a Unificationist observer of L’Abri, I think there is a universal layer in their work. Though unable to speak to the truth claims of any one religion over another, I think these higher-order principles of behavior and belief are paramount to vital community, and worth observing. 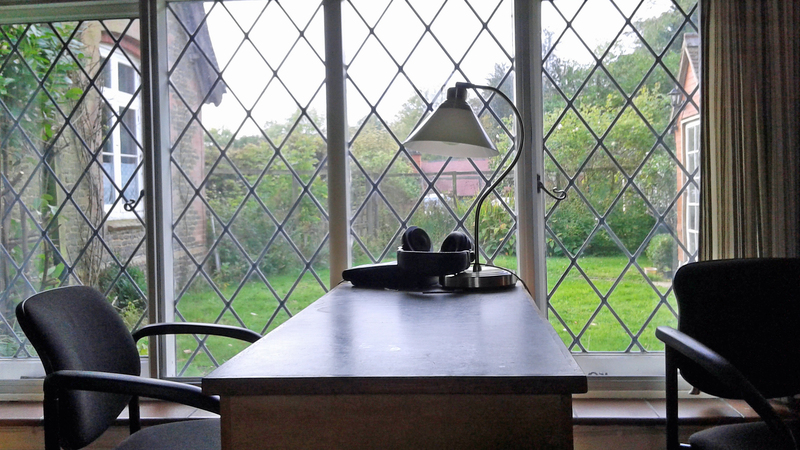 One of several desks set up in a makeshift study area at the English L’Abri community. A tape recorder sits on the table, which some students use to listen to lectures from L’Abri’s archives, though most used their phones to access lectures during the author’s stay (author’s photo). The heyday of the home church providence in the Unification Movement during the late 1970s and early 1980s had passed long before I was born, so I have no memory of that era in the movement. I have only heard stories about how harrowing the experience of trying to serve a neighborhood of 360 homes in New York City could be. I also don’t know much about the education or training that may have been given to accomplish home church. However, I think it’s worth noting that the forefront of the providence seems to have returned to the level of the family, the home, and the neighborhood in recent years, with True Mother’s revival of the idea of tribal messiahship, a concept closely related to home church. Most recently, True Mother’s call to tribal messiahship has often been translated into action as officiating the Unification Church’s Blessing Ceremony for 430 couples, who, she recently clarified, are in turn expected to bless 430 couples. I happen to know several of the first couples in America who have accomplished the first step in this monumental task of tribal messiahship; they are now returning to the 430 couples and families they blessed with a heart to communicate more about the significance of the Blessing and the identity of the True Parents who have made the receipt of the Blessing possible. In discussing home church, therefore, it is not my intention to disparage the work of these courageous brothers and sisters who have put themselves out there in faith and worked hard to fulfill True Parents’ directions to the movement at this time. But as these tribal messiah couples are only now beginning the process of educating their tribe after giving the Blessing, I sometimes wonder if a crucial step was missed in the tribal messiahship process: and that step would be the step of home church. At different stages in our lives, I believe most of us find ourselves searching for home: for a vital, authentic community where we find a sense of belonging. I experienced this sense of belonging and home, surprisingly, at L’Abri, while sitting at table with strangers and friends, sharing food, faith and life together. My experience suggests that whatever the religious context, a relational, hospitable life somehow satiates our immediate longing for home; meaning that a Unification home church ministry, based around the kitchen table, family life, and the word, might do much to satiate that longing today. For me, the question of what will satiate our deeper, ultimate longings for community, highlighted by L’Abri in the idea that all human persons are strangers to God, others, and themselves due to the Fall, remains unanswered. When faced with genuine secularism, genuine Christianity, and genuine Unificationist belief, it’s hard to say which one has a better or truer answer. But I do think the most successful movement in the years to come will be the one in which relational life, strengthened through genuine hospitality, will win the hearts of future generations suffering from the anomie of postmodern culture and technological takeover. If my disaffected generation is going to be won over, it will be through substantive relationships, especially substantive relationships of faith. Here, L’Abri provides an important caveat to the overeager tribal messiah: a time of substance must be preceded by a time of prayer before the God “who is really there” and who takes an active interest in our efforts to build His kingdom and seek His righteousness. Mi Young Eaton (UTS Class of 2018) enjoys exploring the intersection of faith and reality, as well as that of art and truth. An aspiring author, she works hard to write what she believes to be true. Now that she finished the daunting task of writing her master’s thesis, from which this article is adapted, you will soon be able to read more of her musings here. Photo at top: L’Abri guests at their Swiss community, 2012. Thank you for sharing your experiences and lessons learned while staying at L’Abri. Through the words of your testimony I can sense that “something” within you met with our common source, namely God, our creator. That is the most essential point I perceive from the lines of your writing. I believe the future will be spearheaded by those who practice unconditional service for the benefit of others without underlying agenda. Such a culture in practice will outdo the best and most appealing teaching and/or theology, simply because that is our creator’s innate and central nature. Perhaps the concept of service without agenda was the unseen but permeating quality at L’Abri that resulted in the experiences and insights you describe. Thank you, Mi Young. I read your article with great interest; a good friend of mine went to a L’Abri community in Holland after we left high school (50 years ago!) and had a life-changing experience. She was especially moved at how she as a Jew was embraced by a Christian community. And while reading what you wrote, I had to think often of my introduction to DP by the “Creative Community Project” of the Oakland UC. I joined because of that loving community, where ideals were lived, not because of dogma or a messiah or a mission to save the world. But of course, living as a single person, whether it be in L’Abri or Camp K or wherever, is relatively simple. It’s moving past that, to the family stage and beyond where real challenges emerge. I very much resonate with your comment, Johann. I found this article to be such a deep and honest sharing of a transformation of the heart and soul that occurred by being in the presence, in a certain ambiance/atmosphere, that is a catalyst for change deep in the heart and soul of those who dwell in it. The idea of creating a space where such transformation is offered and allowing the people coming to absorb the spiritual nourishment, at their own pace, is truly an expression of unconditional love. And because it is unconditional, something deep down in the soul is touched and responds. In that personal response, the magic happens. Thank you for that very thoughtful and stimulating article. In my view, such communities are based on the Principle and such people and communities generally understand the Principle and its application much better than we do. In my opinion, any community or institution based on the Principle flourishes and grows. I think the Unification community in many parts of the world hasn’t flourished or grown for decades because it is not really based on the Principle — because, in my experience, UC members don’t understand it, don’t teach it correctly, let alone know how to apply it. Thank you for this, Mi Young. Reading it was almost like being there. You made a valuable and innovative point in setting home church as a way-station along the road to tribal messiahship. Also your critique of tribal messiahship or, rather, our practice of it (in the U.S. at least), was well-taken. One respondent noted, correctly, that it is relatively easy to create a space such as this for singles (or people living as singles). It is once family life starts that things get complicated and no culture has solved this long-term. Which draws us back to the home church model — not the model of 360 homes, but that of “my home is a church,” based on the real achievement of the Blesing. Which brings up a question — if you paid a fee for living there, then this really isn’t a social model. Did you pay a fee? Excellent question on the fee, Dr. Hendricks. And fair response by Ms. Eaton. A fee, even a nominal one, does change the perspective here, though very thoughtful, a bit. And for more perspective, recall the influence of Dr. Shaeffer on Evangelicals (and others) of recent note. The UCM is — a work in progress — tribes are on the move — though sometimes, perhaps, imperceptibly. Thank you so much for pointing to “The Attitude of the Evangelist” speech. Recently, I was having a specific question about how to relate with people I am outreaching to and found the answer in this speech. Thank you so much EG Pierson for giving this link. There is so much in this speech of True Father. 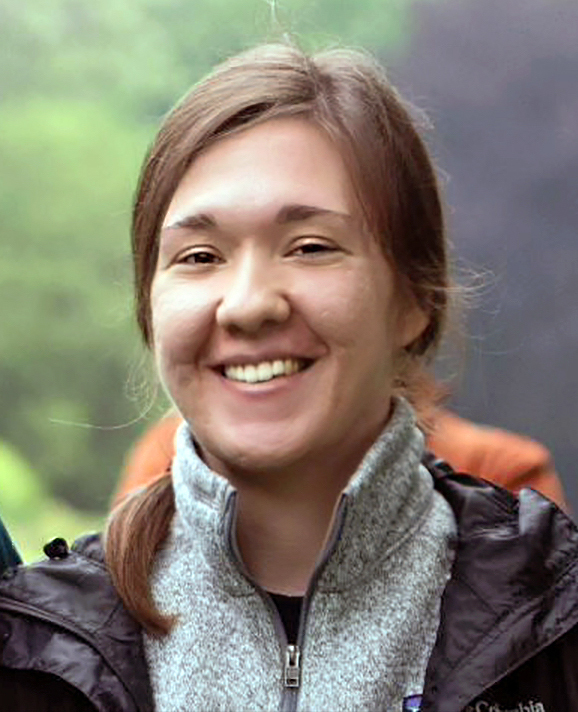 Thank you, Mi Young, for sharing a part of your Master’s thesis through your article here. You have touched on several important points: Living by “the Principle,” building community and expanding or developing a community from the small group to a social or global level. Too often there is a belief in magical and explosive growth within the Unification community. Our ignorance of history is usually to blame. The explosive growth of early Christianity during its first four centuries was the result of a 1 to 3% growth per annum according to Richard Stark’s “Rise of Christianity.” It was steady and slow development and grounded in establishing community, that included both single individuals and families. They also excelled in taking care of the sick. Most growth was through networking among family, extended family, and friends. I was in England in 1978 when Sun Myung Moon initiated the Home Church providence. He provided very clear and systematic guidance on how to develop a home church community in several speeches and one that is indelibly etched in my mind is one delivered on July 4, 1978. If the Unification Movement had simply continued doing this type of step-by-step principled work which eventually became the “hometown – tribal messiah” providence of the late 1980s and early 1990s, imagine what type of network there would be? For multiple reasons, there has been a lack of a consistent strategy and follow up. Your raising this important issue through your writings may be what is necessary to bridge the gap between the aging first generation and the younger generation who long for a sense of community such as L’Abri provides to seekers. Thank you, Mi Young, for sharing this important testimony. My head wants to talk, but my heart is telling me to be quiet and assimilate what you are telling us, first generation parents. I want to thank you all for your comments so far. I feel meaningfully heard and encouraged. I still feel that L’Abri was, by far, the most Principled community I have ever been a part of, in response to your comment, Mr. Haines, and appreciate the different ways in which the nature of such a community has been described by others in this forum: “unconditional service for the benefit of others without underlying agenda” as reflecting “our creator’s innate and central nature”; “that loving community, where ideals were lived, not because of dogma or a messiah or a mission to save the world”; “creating a space where such transformation is offered and allowing the people coming to absorb the spiritual nourishment, at their own pace, is truly an expression of unconditional love.” Each of these expressions captures in a unique way the character and the power of L’Abri and prompt me to further reflection on the relevance of this topic to the Unification community at this time. Regarding the issue of singleness, one interesting thing about L’Abri is that its staff, called “workers,” is made up of both single people and parents, whose families live amid the work of the fellowship. The current staff of L’Abri follow the Schaeffers’ example in this, though they have also found it necessary to introduce boundaries to protect their children from the sometimes unhealthy stresses of an open home. At the same time, L’Abri doesn’t seek to be a locus around which an extended and entrenched Christian community grows but rather a stopping point on the journey of their visitors, who will continue on in their “real” lives having been transformed or found new purpose to guide them in doing so. I think this does reflect the exciting possibility of “home church” as you have described it, Dr. Hendricks, as a truly and enduringly blessed way of being. The fact that visitors do pay a modest fee to stay at L’Abri was another, later, addition to the fellowship’s organizational policy, I believe, reflecting an understandable step toward institutionalization as the original fellowship in Switzerland grew to include several branches abroad; and I agree that this might limit L’Abri’s relevance as a pure social model. But it is not at all L’Abri’s intention to be a social model or to replace the more traditional institution of the church; it’s more, in looking back on my experience at L’Abri, that I was hoping to eke out the seeds of such a model that might be adapted to and nurtured in a Unification environment. I look forward to reading the speech you’ve referenced, too, Mr. Famularo, as I continue to explore home church from True Parents’ perspective, and am left with the thought that perhaps our just urgency to restore God’s sovereignty throughout the world might be better manifested as a steady sincerity than a headlong rush.